Every Plasticos trip involves its own challenges. One is sterilization of supplies and instruments and each country seems to have a different system. In the US, steam sterilization is the norm for metal, with instruments wrapped in special wrap, then autoclaved at high temperature with steam under pressure. 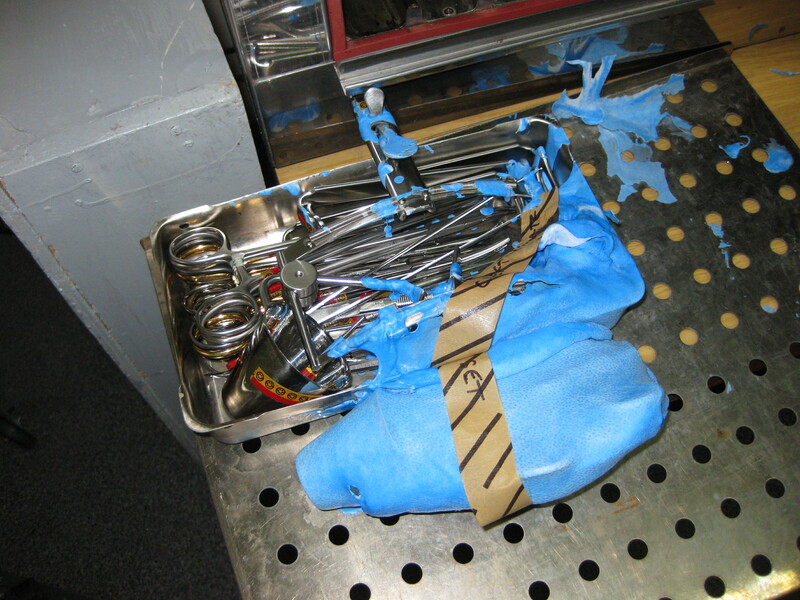 After the first day of surgery, we carefully wrapped our instrument sets in the special wrapping only to find the next day, that the wrapper and melted and hardened on the instruments! We quickly put everything in water and began the arduous task of chipping away the plasticized material from each instrument. Many of the Armenian nurses came into the instrument room to help us excavate the instruments off the trays, until finally we were able to re-sterilize them by other means and begin surgery. We have had many strange things happen, but this was definitely was a first! For this reason,we got a very late start to surgery, the first case didn’t go in until 10am. Normally our day finishes around 8pm but today the surgical teams operated until 10pm!